Exciting Work News & A Love/Hate Relationship | Run, Lindsay, Run! Today was a pretty good day. While it started off a bit sweaty (more on that later), I’ve been looking forward to today for a few weeks now. I made sure to wear my cute new navy skirt, my favorite sassy gold heels, and be in a great mood. Why? I am now a Senior Associate, which basically means I’ll keep doing what I’m doing, but with a new title and a few more responsibilities. And my lovely co-workers Jamie and Anjelica were so sweet to make me a cute card and bring me a huge Crumbs cupcake to celebrate! How cute are they!! And I just ate the entire Crumbs cupcake in bed while writing this post. #WINNING is right! In running news, summer weather has really hit NYC in full force. With highs in the mid 90s today, I’ve been reminded just how much summer running takes out of you! This morning I struggled through 4 easy miles along the Hudson River, and was a sweaty mess by the time I finished around 7:30 am. And so begins the love/hate relationship I have with summer running. When you wake up in the morning, it’s light out! So much easier to get out of bed. That you can run decently late at night and it’s still light out! Sports bra runs, though I feel a bit awkward in the city streets until I get into the park. That cold showers can actually feel refreshing! Well, I guess all in all there are more ‘loves’ than ‘hates’ on this list. I expect the hate list to grow a bit more as we get into July and August 🙂 Just have to remind myself to not get too dramatic: I’ve survived summers past, and will survive this one as well. Imagine that?! This weekend I am racing the NYRR Mini 10K, which will actually be my last race this ‘training cycle’. After the 10K, I am going to take 3 weeks to run what I want to, when I want to, but not stick to a schedule or weekly mileage plan. Basically, I want a bit of a mental and physical break after this race while continuing to run ‘for fun’ until the beginning of July when I will start slowly building up my mileage and kick off my training plan for the NYC Marathon on November 6th! Gearing up for a race 4 months in advance might seem like a long time, but you really need it to get ready for a marathon. I want to get in a good base slowly and work on upping my mileage for this year’s race. Last year, I ran the highest mileage I’ve run in my life up to that point: I hit around 45-55 miles per week most weeks and barely a few weeks in the low 60s (see my full training schedule here), and found I responded really well to higher mileage training. I could actually notice my fitness levels increasing run by run, despite not too many or too long tempo workouts. As I look to break 3:00 this year, I want to bump up the average weekly mileage a bit by 5 or 10 miles per week on average, and try to get in at least one workout per week. This will be so much easier (and more fun!) with the Central Park Track Club weekly workouts and all the new running friends I’ve met! I still need to work on mapping out my plan, and will post it when I figure it out, but those are my initial goals. Which brings me back to Saturday’s Mini 10K. I am aiming to break 40 minutes in the 10K this time around. After my 40:36 at the Healthy Kidney 10K and 32:06 at the Spring Lake 5 Miler, I know this is within reach if I keep it steady on the first 2-3 miles and save a bit for the end. Hopefully knowing it’s my last true race effort for a while will help me out! What’s your favorite season for running? What do you love and hate about summer/hot weather running? I love running in the fall. Give me short sleeves and capri spandex, and a trail with leaves turning and falling and I am happy! Fall also reminds me of cross country season and the kick off of a school year, which always meant excitement about running and getting miles in. I much prefer summer running to winter running. I kind of like summer running actually. I think its from all those hours I spent on a tennis court in the summer…kind of reminds me of that. Ahh, nostalgia. Last summer was also when I made a lot of improvements with my running so I guess I have a positive association with summer running! I do NOT like what running in the heat does to my stomach though. I tried a few 400s and 200s yday (and died) and I think I was nauseous the rest of the night. I’m also running the Mini. I’ve debated “racing” and “just going for a nice morning jog” since I’ve only been social running since that May marathon. I think I’m just gonna try and see what happens (which prob means I will die on the Harlem Hills). My PR is 49:52 and although I always love to beat my previous PR (it hasn’t been hard in my time running thus far, perks of starting off really bad), but not so sure about that this time! Ha, I was not shy about doing summer training runs in a sports bra in NYC last year, and even though female runners are just as brazen here in TX (rightfully so, it is HOT down here), I’m one month into summer running and haven’t lost the shirt yet. Soon enough! I’m also excited to start official training for NYC, but not so much for early Saturday alarms! 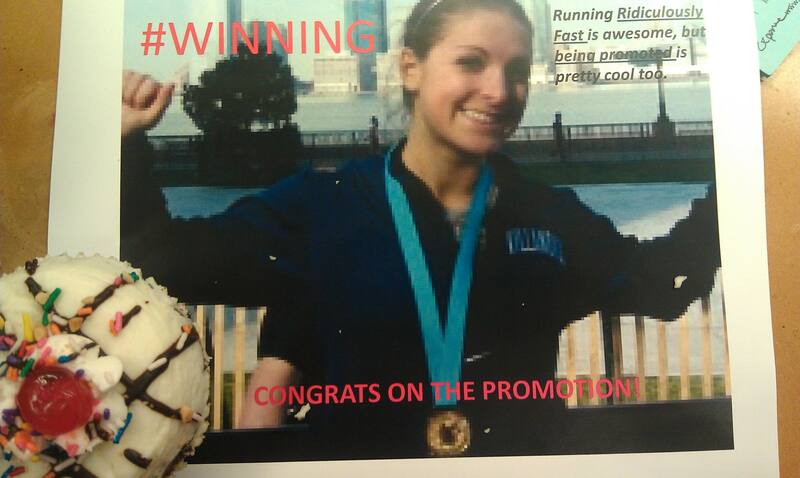 Super congrats on the promotion…yay! I think I like fall running the best….the cool temperature feel nice after a hot summer, but it’s not HOT and t’s not COLD. Although I think I run best when it’s about 35 degrees…certainly not my favorite, however. Congrats on the promotion, lady! You deserve a celebration! I like summer running for the same reasons you do – early a.m. runs in day light are the best. And, I love that it coincides with NYC Marathon training 🙂 I could do without the humid grossness of late though – runs in that stuff makes me feel so wiped! Good luck tomorrow – I’ll be racing too. Here’s hoping for decent weather! WOO HOO! Congrats!! I can’t believe you posted the card. You’re the cutest 🙂 I’m glad you liked the cupcake. I still haven’t decided about running tomorrow. I really want to but am not in the best mind frame with my weird little foot. If I do, we should meet up! Good luck breakin’ 40 minutes. You go girl! congrats on the promotion!!! so exciting! gooooood luck tomorrow – you’ve totally got the sub 40!